Bear with me. I’m going somewhere with this. Back in 1993, when NBC announced its concept for the first ever Star Trek spinoff, I wondered how a static setting like that of a space station could sustain a sci-fi show with the word “Trek” in its title. For the record, I enjoyed the first two seasons of Star Trek: Deep Space 9, but, sure enough, the ratings started to plummet, and the writers quickly introduced broader elements of adventure such as the Dominion empire and the Defiant spacecraft. 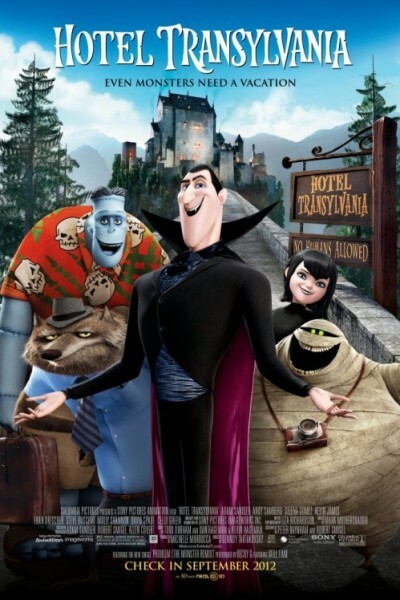 Now comes Hotel Transylvania, a children’s monster comedy that, like Star trek: Deep Space 9, promises all kinds of wacky creatures but restricts them to a single environment. Strangely, I didn’t have the same apprehensions, partly because the five-year-old in me was seduced by the idea of Dracula (Adam Sandler), Frankenstein’s monster (Kevin James), and the Mummy (CeeLo Green) building a refuge from torch-carrying mortals, partly because I figured the zaniness inherent to director Genndy Tartakovsky’s animation style would allow the movie to escape the shackles of its stationary premise. After all, it’d be so easy to relocate the hotel by way of sorcery, introduce an intolerant human mob with goofy technology, or fill every room with magical threats that defy all common sense. 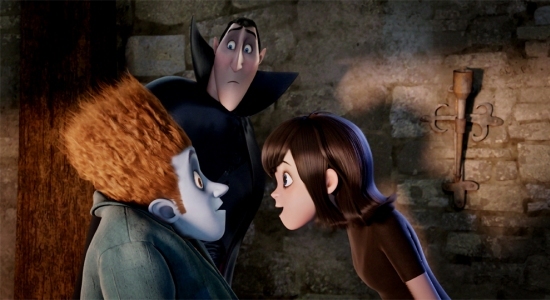 Instead, Hotel Transylvania sticks to a rigid sitcom formula, that of the overprotective father lying to keep his daughter close only to realise he’s standing in the way of her happiness. The twist lies in the father being Dracula, of course, and his daughter Mavis (Selena Gomez) falling for a human tourist (Adam Samberg) whom Chef Quasimodo (Jon Lovitz) desperately wants to cook. However, these elements don’t add to the supernatural adventure so much as pad the runtime with relentless slapstick, making the whole thing feel like a prom date doing an elaborate stand-up routine when all you want to do is dance. In fairness, Hotel Transylvania does take the time to build its characters if not explore them. Consider such clever touches as Frankenstein’s passive self-esteem issues (I know; he should be called Frankenstein’s monster) or Steve Buscemi’s depiction of the Wolfman as a father on the verge of a mid-life crisis. I also like Mavis’ love interest, Jonathan, whose mannerisms embody the sort of easy-going fellow you’d expect to backpack in strange places without a map or itinerary. The boy seems incapable of intolerance, making it easy to understand why isolated personalities like Mavis, the hotel guests, and ultimately Dracula would grow fond of him. The young lovers have some genuinely sweet moments as well, helped in part by Adam Samberg and Selena Gomez keeping their cartoon voices at about Kim Possible level, which is relatively grounded for the genre. Adam Sandler and his friends, on the other hand, play their characters so broadly that every piece of dialog spouted out of the adult monsters comes across as a loud, clownish shriek, sort of like a mob of deaf old men playing peek-a-boo with a baby, not realizing the little one has been screaming in terror for the past forty-five minutes. I know what some of you are thinking: that’s just what Saturday morning cartoons are like, and no one complains about those (except maybe the parents who get woken up by the stuff after a hard week at the office). By the same token, the sitcom template has sustained thousands of television series every week since the late nineteen-forties, so what’s the hubbub? For me, the difference lies in that each episode only lasts half an hour with at least three commercial breaks for mental respite. As I mentioned in my review of Pirates of the Caribbean: On Stranger Tides (2011), there exists such a notion as too much of a good thing. In the case of Hotel Transylvania, I’d argue there’s too much of the same thing. Admittedly, most of the jokes do, in fact, land, and you’d be hard-pressed to find such endearing animation in the Nickelodeon lineup (I especially like the ink drawings during the end credits). However, at some point, I needed the story to show me something different, go somewhere unexpected, which it never did. Then again, kids can spend a whole day watching Sponge Bob Square Pants, and sci-fi geeks still clamour for more Star Trek after seven hundred and twenty-six episodes, so what do I know?